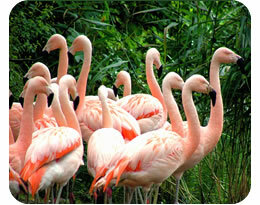 Flamingos build cone-shaped nests of mud with a dip at the top to prevent the single egg from rolling off. Upside-down filter feeders, they use their tongue and beak to pump water and collect food, and stand on one leg to save energy and retain body heat. Parent flamingos can recognise their chicks by their call in a crowd of around 30,000 other youngsters. A flamingo’s leg does not bend backwards; what looks like its knee is actually its ankle and so bends the right way. The knees are hidden under the wings!